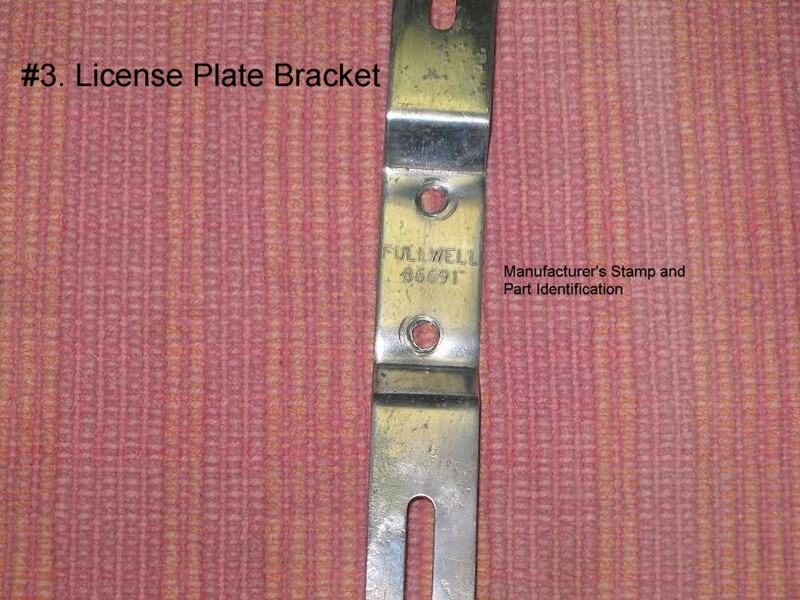 I was choosing a License Plate Bracket for a customer’s 1967 Beetle. Not having focused particularly upon this part, I first examined the Bracket on my own ’67 Beetle. I did so upon the premise that my car’s equipment is original and correct. So, I performed my examination. Then, I went to my storage and selected the bracket box where I found several—some identical to my own Bracket and some a bit distinctive. I choose one which was in the best condition. It is of aluminum and had the least bends in it due to years of usage. I also discovered that it is stamped with a manufacturer’s name and a part number. The name is in all capital letters: FULWELL with 86691 stamped directly beneath it. I looked at my car’s Bracket—identical. I checked with Eric Shoemaker—his, too, was identical to mine. The manufacturer’s name sparked something in my brain and caused me to call one of my chief consultants: David Brown of Pennsylvania. As you may recall from past articles, Dave was trained by VWoA in their parts business. When he answered and I had explained the reason for my call, Dave laughed. He told me that he had not thought of Fullwell for many years and then told me that my brain-alert was correct. The ’67 and other models (perhaps all models at least following ’67) came to dealerships sans License Plate Bracket. Dave told me that he recalled two notable dealers of parts which frequented dealerships, hawking their parts to accommodate the needs of the make-ready department, for one, to prepare the new cars for the customers. Dave said that salesmen came to the dealerships carrying their valises which, when opened, revealed catalogs of parts they were offering. Dave recalled Fullwell and Curtis as being two of these providers of such necessaries as the Brackets. This said, it is possible that there were different Brackets from different suppliers here in the USA. 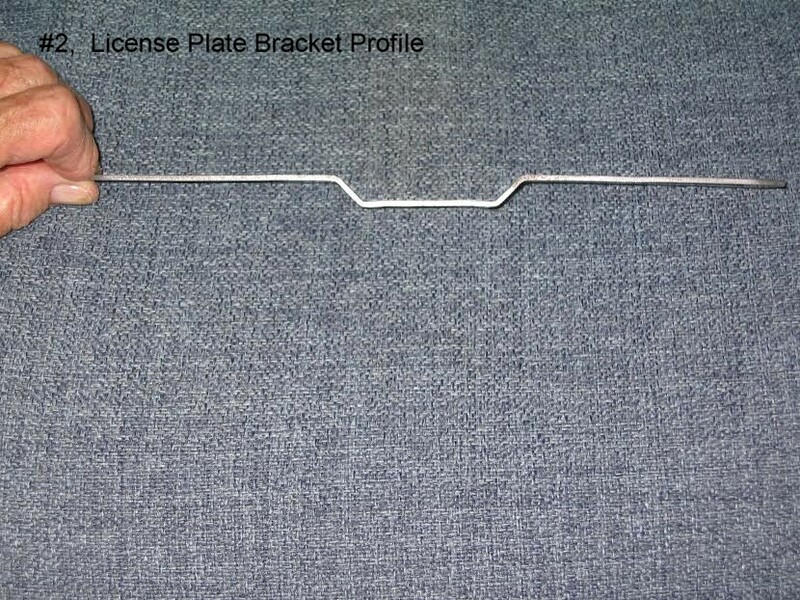 If your 1967 Beetle has a Bracket unlike the one which I describe, do not become alarmed. There may not be a right or wrong Bracket. While we are at it, let’s discuss for a moment the 1967 License Plate Light Housing itself. There were two manufacturers of this Housing: Hella and Hassia. By far, Hella apparently manufactured most of these Housings. Although Hassia installs the attaching studs a bit differently, both Housings function identically and affix to the decklid identically. All hardware is identical. The basic design of this Housing began in 1967 with VW Part Number 111-941-023A. A difference occurred in the mid-to-late ‘70s with either a metal or plastic Housing with ridges on the center-top of the Housing. The Housing for 1967 should be smooth metal with no ridges. Washer-headed 1/4th inch screws for flat-bladed screw driver with 5/8ths inches of thread. I will check mine, I knot is original and report later. I have had it off a few times in the past 43 years, not sure the screws were reused. Hope so, I usually tape things together so I dont lose little parts like this. For reference…my 67 is 117 303 470, built Oct 66 I believe. My light lens is Hella. And my plate bracket mounts using the same holes/hardware as the light housing itself. It does not look like the Fullwell bracket in the photos above. I’ve seen many original paint cars, from the ’60’s up to my own ’79 and can confirm what the author states, most, if no all of these cars came without brackets so there are a few different styles available. From the one shown above that is drilled and mounted directly on the lid to those that are fitted under the light housing. My ’67 that I bought in ’76 [original paint], had one mounted under the housing as well as the original paint ’69 I bought in 2010, and my ’79 vert that I bought in ’83 [also original] has the plate mounted directly on the lid without any bracket! I guess the dealer wasn’t to fussy about it. I’ll have to check mine, as it’s OG to the car. Jay, you seem to unlock all of the mysteries. As I said to Jay earlier on the phone, I feel like I’m a ’67 “expert.” However, everyday I realize I don’t know that much. I’m just the web guy behind the scenes. I think in California they liked to mount the plate directly to the deck lid, that’s what mine has, wouldn’t I have 2 holes inset if they had a bracket at one time? I thought I was missing a bracket that would hold the plate lower below the light housingm ( cause you can’t read the plate frame holder logos on top very well. if they had a bracket to attach to the light frame, mine probably got taken of and someone decided lets just mount it to the deck lid..doubt the dealer would do that, cause you have to shim it out a little or it will scratch the paint! 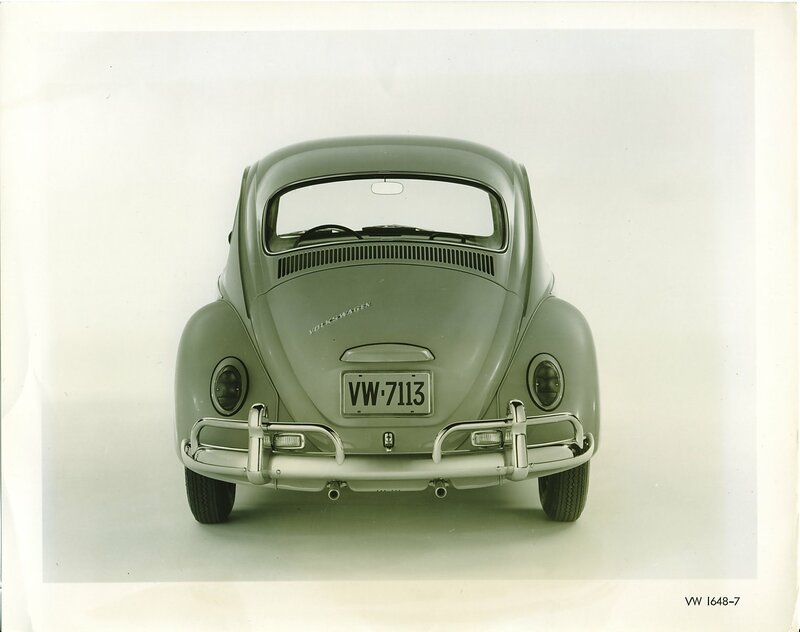 To throw everyone for even more a loop, look at this early ’67 Beetle press photo. How do we post photos in the comments? You have to know basic HTML. It’s just an embed tag. (Mine looks like the pic Eric posted) the bracket itself has no mfr stamp any where, but identical in shape & size. My tag light housing is Hella, several #’s, but none matching the numbers you posted. Either way, a great way to learn more about this wonderful vehicle. Thanks guys for the leadership. 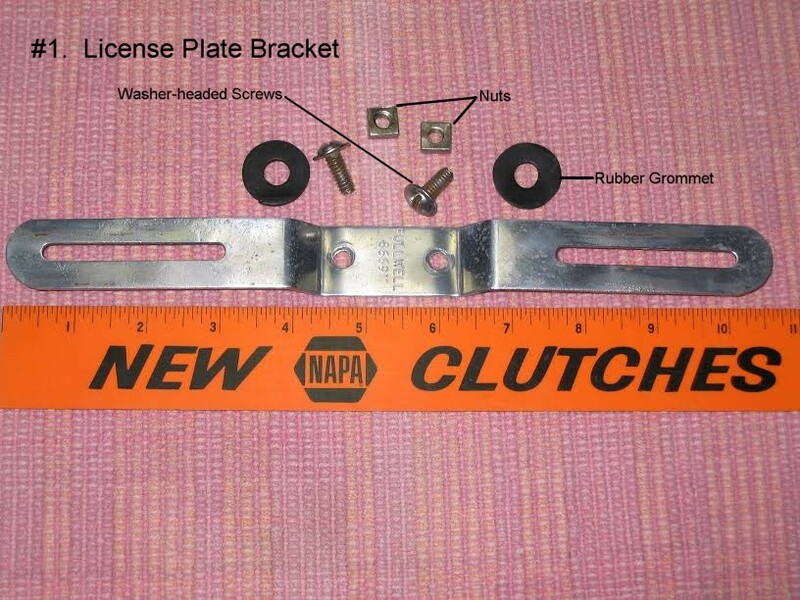 I checked my lp bracket, and it does not look anything like the one pictured here originally. Mine is actually fastened to the deck lid at the points where the license light housing mounts to the lid. The offset is longitudinal along the bracket rather than like the one pictured. Totally different. It looks very specific for the Beetle application. Hello, Todd…I bet that I know which one you have. I have one in my Bracket Box which is marked as having come from a ’67 Bug. I’ll see about a photo of it for the comments section. Ryan(above) also has a photo to be posted. Eric…? Yes Jay. It seems that there are a few here described something like I did. I did not remove mine because the light housing on the lid comes off too. I bit too much work, and dont want to disturb any paint either. Would like to know if there is a name or part number on it though. I will look for your photo. I love that this article is getting such great interest, etc. Go, Jay!